We had an early 4th of July party on Friday. It was more of a dinner than a simple cook out. (Work related thing) I wanted to make things that would NOT require me to be in the kitchen all day and during the party. I made appetizers, marinated two beef tenderloins to put on the grill and decided to set up a potato bar and deserts. I wanted to have cute jars for the toppings. Something for the 4th. Yikes, the mangoes have been coming fast and plentiful. I have been making lots of recipes, but it seems I have no time to post. Too many mangoes to cut up! We are getting around 40 per day! The first thing I had to make was salsa. 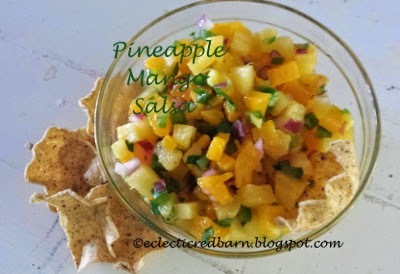 We love our salsas and mango is my favorite. I was so lucky that one of our pineapples was also ripe. 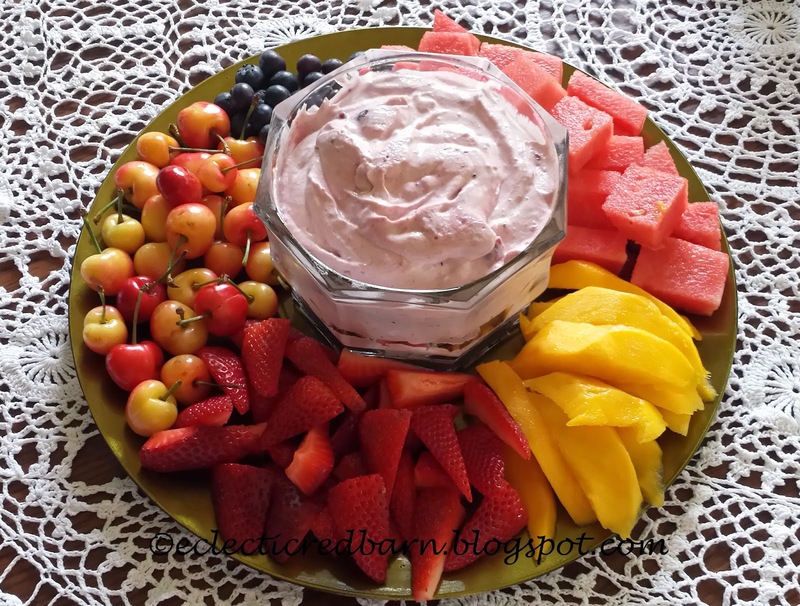 It is so wonderful to make fresh food from your own fruits. It doesn't get any better than that. I am so pleased to welcome Alice as my guest today. She will be posting about decorating with red - one of my favorite colors. Maybe you will find some inspiration. Hello everyone. I am Alice and I am a blogger at Yorkshire Linen. I like to experiment with home decor and interior decorating. 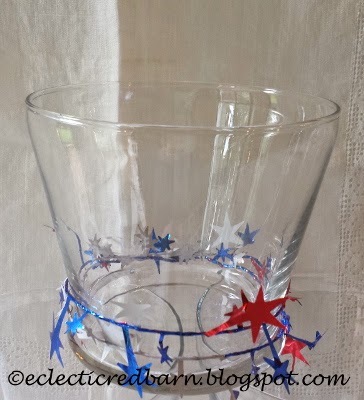 Since childhood, I liked doing DIYs and finding new ways to make my home look beautiful. You can contact me here. Red is an unusual colour: one of the three primary colours and therefore used widely in décor, art and fashion, but it is not a popular favorite colour. 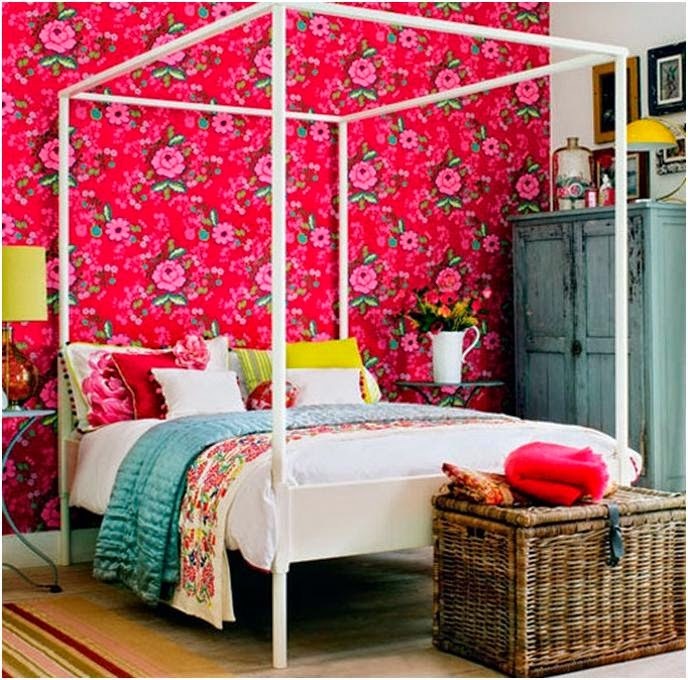 Therefore using red in décor can help your rooms to stand out from the crowd, creating a warm haven for your family and friends – or yourself, should you decide to use it in your bedroom. There is nothing like harvesting your own fruit and vegetables. 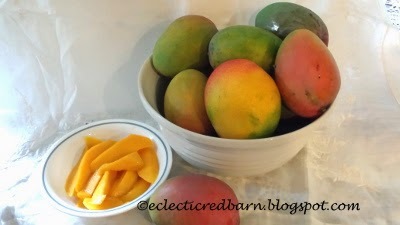 This weekend was the time to harvest our first mangoes.Yeah!! You wait and wait and then all of a sudden, they are everywhere. Welcome to the Triple Celebration Giveaway at God's Growing Garden. Hope you stop by and check out the wonderful prizes and meet all of the hosts for the party. We have Cash prizes, Ad space and Gift packs. You don't want to miss it. 3 Reasons to Celebrate , 3 Prize Packs & 3 Winners!!! With summer right around the corner, that means backyard parties, cookouts, and fresh fruit. Although most fresh fruit is available all year, nothing beats fresh fruit in the summer, especially if you have fruit trees. Just spent a wonderful week in Vermont with my grand children. The weather was great, which is rather unusual for this time of year. 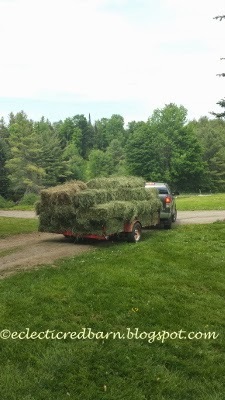 It seems that each year, no matter when I go to Vermont in the summer, we put up hay. My friend boards her horse at my son's barn so she asked if I could help with the hay this year. Because of the great weather, the hay was beautiful and baled early. So off we go to get the hay. I didn't get any pictures loading the bales since I was working to hard. Here we are backing up the trailer with the first load - 66 bales. We all seem to be trying to watch our weight, especially with summer right around the corner. 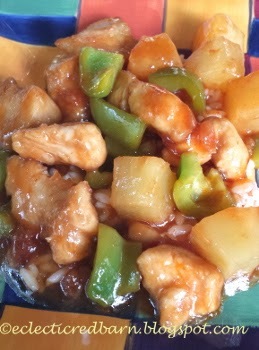 However, we still want to be able to eat some of our favorite Chinese foods without feeling guilty. I have this thing for chairs, well lots of things actually, but really chairs. I guess I feel the need to rescue them sometimes. This was the case with the well worn, or as my husband says, "garbage" chairs. I was taking the dogs for a ride on the golf cart, their favorite thing to do, and spotted these chairs on top of a pile of other junk and tree trimmings. They weren't in bad shape except for the fact that the seat was gone. Does that count?